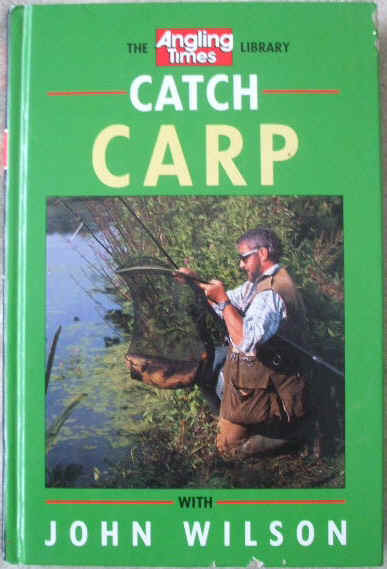 First edition, first print hardback of CATCH CARP WITH JOHN WILSON, by John Wilson and published by Boxtree Limited. London, 1991. Published as part of the "Angling Times Library" series. Illustrations by David Batten. The book is in good condition (Clean glazed pictorial boards with green & white lettering on the spine) with only slight wear to some parts of the edges (some rubbing & peeling in two parts to the edges at the front) and a couple of tiny bumping marks at the back. No Jacket as issued. Internally, the pages are clean and tight and there are no tears and no inscriptions. "Powerful, hard-fighting and beautiful to look at, large carp are one of the most exciting and highly prized catches for the dedicated angler. However, carp of all sizes are found in lakes, gravel pits and some rivers throughout the country, and all provide challenging and rewarding fishing. John Wilson shows that it is not necessary to buy expensive, highly specialized tackle or to spend days concocting your own exotic baits. John Wilson is Britain's top angler and fishing writer, and the presenter of the Go Fishing television series. He brings his usual enthusiasm, energy, and experience to this indispensable guide, providing all the advice and information you need to get more out of fishing. Detailed analysis of the fish's habitat, behaviour and feeding habits. A comprehensive study of the best baits and how to use them. Illustrated by over 80 colour photos and many diagrams." 127 pages. ed with colour photographs and technical line drawings.